There is nothing quite like the fronds of a fern. 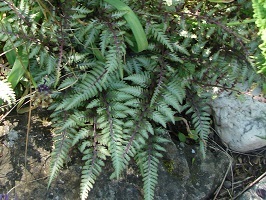 These prehistoric plants are easy to grow, need little attention, and thrive in those sometimes awkward, shady spots of the garden - whether dry or damp - depending on variety. Ferns may be evergreen or deciduous and can grow to an impressive size like Osmunda regalis (Royal Fern) the largest of our native ferns, growing up to 7ft, or stay petite like Athyrium niponicum 'Metallicum' (Japanese Painted Fern) which has distinctive silver leaves flushed with maroon, growing to around 1ft height and spread. 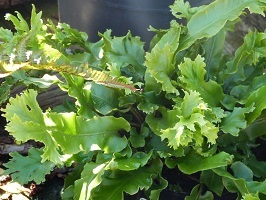 Other ferns you may find in stock include Asplenium scolopendrium (Hart’s Tongue Fern), the native, hardy spleenwort which grows to around 2ft tall and is good in dry soil, and King of the Ferns, Dryopteris affinis Cristata 'The King' with its classic ‘shuttlecock’ shape. 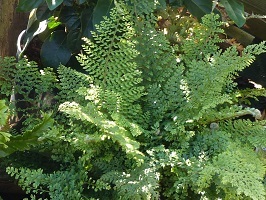 Evergreens include Cyrtomium falcatum (Japanese Holly), Polypodium vulgare, Polystichum setiferum 'Herrenhausen' and Dryopteris erythrosa (Japanese Shield Fern) an evergreen shuttlecock-shaped fern growing to 1-2ft. 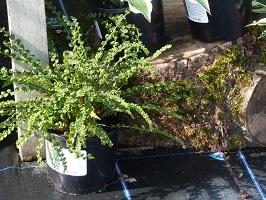 Most of our ferns are available in one litre pots, priced £3.99 each.